For a healthy and happy baby. Excellent diapers. I was searching for the best there is for my baby boy and then i found these. We are using them since the first day, now he is 3 months old, and we had no problem whatsoever. Great service. Thank you Beaming Baby. I have found that your bio degradable diapers are very good. My baby girl has not had any rashes and they are very absorbent. Thank you! i love these diapers they smell lovely and really sorted out my baby's diaper rash. I love these diapers. As well as being very eco-friendly they are a really good quality diaper that absorbs well and does not leak. My only critism is that the sizes don't follow the industry standard so I inadvertently bought a bulk load of ones that are too big. Make sure to check before you buy! Brilliant diapers, good for night time. We try to use cloth diapers the majority of the time at home, but wanted something to use when out and about, and also to last through the night (which we haven't managed with cloth). I heard Beaming Baby diapers were good for long stretches so gave them a go and haven't looked back since! We use these for overnights, nursery and out and about when our reusables just aren't up to the job. Been very happy with them, always contain the poo and deal extremely well with the overnight wee! Never caused diaper rash for her. We use these diapers overnight and when we're out and about (we use washables at home). Their performance is equivalent to Pampers, and they are far superior to Nature Babycare. The cammomile scent is nice, and we have had no diaper rash at all. No poo leakage to date and great absorbency. Great product, easy to order online. Have used the eco diaper since our baby was born, now size 3. Great product, easy to order online. Very absorbent, my first choice in diapers ? Brilliant eco diapers. No leaks, keeps baby dry and are great for the environment. Quick delivery and easy to use website and order process. Product is especially good and nice to know we are wreaking a bit less damage to the environment. Great product, have used them since birth, little one seems very happy, and we are happy knowing that they are biodegradable. Love these, not only are they really reliable and absorbent (only a couple of accident) I like the fact that they are biodegradable. Good website, easy to navigate. 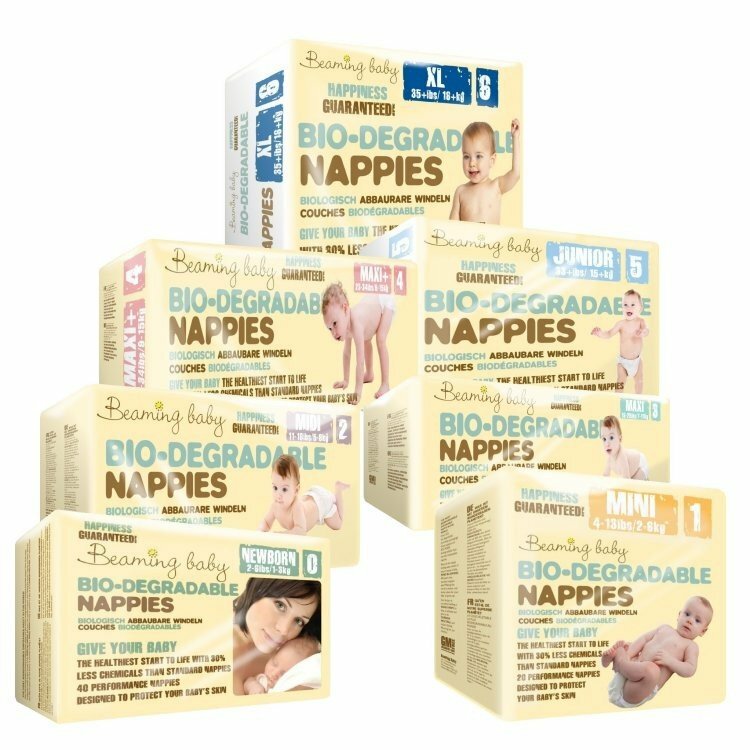 Biodegradable diapers are s good quality nappy. Take a lot of soakage, good on the skin and form nicely to the body. Take over the market from Pampers!! baby feels good in them. Great diapers, baby feels good in them. I always hear back from a member of the team promptly if I have any queries. Really can't say enough good things about Beaming Baby!